"You’ve ruined it. That was my Coal Hill School tie!" 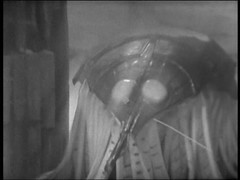 The Tardis has been imprisoned by a force and being dragged down to the surface of a planet. It materialises on a barren world with rocky outcroppings through the surface. 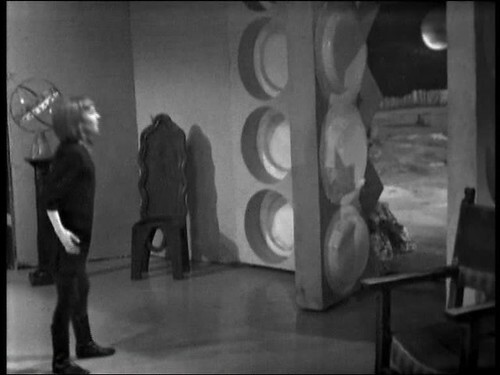 Ian likens it to the moon, while the Doctor wonders what's holding them there. Vicki thinks it looks a bit grim. The Doctor is confident he can counteract the force. 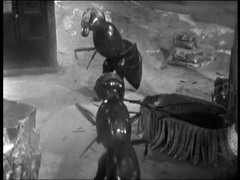 Unseen by the Tardis crew, the Tardis is approached by a couple of giant ant like creatures. Vicki can hear something that the others can't, the Doctor saying she can hear an extra sonic sound that younger people and animals can. Rubbish, this story's obviously written for Susan and her Telepathic abilities! The creatures bring a smaller grub like creature to help them and with it's assistance further immobilise the Tardis. Barbara takes Vicki away to lie down, while the Doctor & Ian go outside to explore and find what is holding them here. The Doctor and Ian don special jackets to compensate for the low pressure and lack of Oxygen. 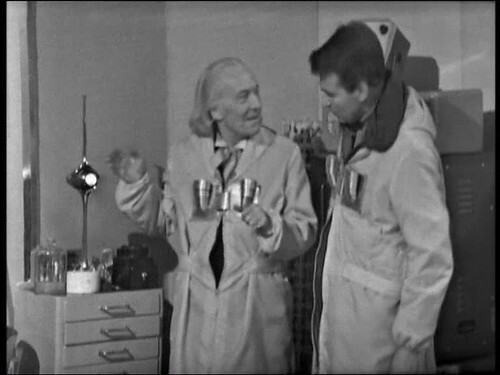 Without the power, and with some line fluffing from Hartnell, The Doctor uses his ring to open the doors. Led onto the subject by the medicine Barbara is giving her, Vicki tells Barbara about her education. Barbara tells Vicki about the bracelet she got from Nero and that she & Ian went to Rome too in the last story. 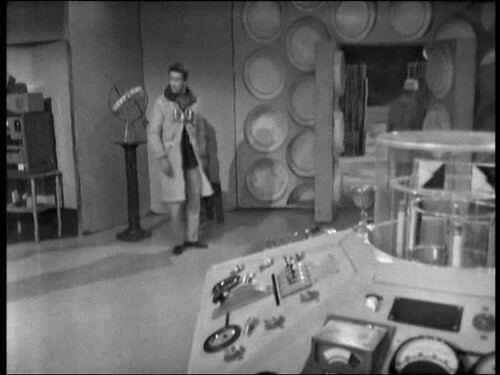 The Doctor and Ian are exploring, as his gold pen vanishes, Ian believes they're being watched. Barbara feels herself dragged towards the doors by her gold bracelet. The Doctor & Ian find a giant pyramid on the surface, constructed many years ago. Ian finds a pool, the Doctor stops him from sticking his hands in. Instead he lowers in Ian's Coal Hill school tie which dissolves in the acid. 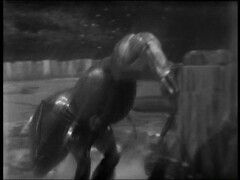 The Doctor, Ian and Barbara all hear an insect like chirruping - the Tardis doors open allowing Barbara to leave dragged out by her bracelet. Inside the Tardis the console spins round influenced by the noise. Vicki wakes to find herself alone and calls for Barbara, which the Doctor and Ian hear. Ian is caught in a trap and sends the Doctor back to the ship: he returns to where they landed to find it gone. A bit of an odd episode, with only a brief glimpse at the creatures the story is famous for. The sets are suitably bleak and alien, aided by some special lenses for the cameras that blur the pictures. This effect will wear as the story goes on and you'll be wanting a clear picture. I do like the nice little tune of progressive notes which is frequently heard on the surface. After some searching I've discovered that it's Rapsody de Budapest by Les Structures Sonores which you can hear a clip from it at iTunes or Amazon. From what we see on the screen it's highly likely that this story was written for Susan and then modified for Vicki. Vicki being affected by the planet, explained away as her having "probably heard an extra-sonic sound" is too much like the instances of Susan being overwhelmed by her telepathy. We learn a little more about Vicki here, and her background as she's disparaging about the medical treatment and tells of the advanced education she received, again possibly a leftover from an earlier draft featuring Susan. DOCTOR: Yes, well, I, er, I, er. I didn’t want to, er. This is the first time that the Doctor's ring, used as a bargaining tool during the Reign of Terror, is shown to be anything but a piece of jewellery. Somehow the Doctor uses it to open the doors! More powers will be seen later. Years later in Death to the Daleks where the Tardis is similarly drained of power the Doctor uses a crank handle to get the doors open! In an episode where a big fuss is made about being able to open the doors without power it might probably have been a good idea to keep an eye on what's happening with them! First the Doctor opens the doors, then he and Ian walk through them. You see the doors closing behind them. We'll be charitable, for the moment, and say they closed the doors from the outside. 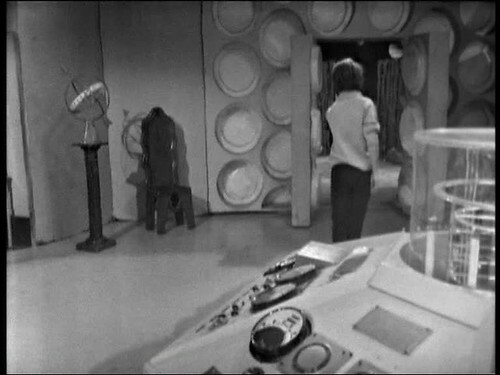 But then when Barbara's been possessed she walks out the Tardis.... through the already open doors! To compound the error they then close behind her. Barbara's possessed, she's hardly going to turn round and close them is she? So when Vicki wakes up and walks into the console room what does she find ? The open Tardis doors! IAN: That’s Vicki. Something’s wrong back at the ship. DOCTOR: They’ve probably left the doors open! 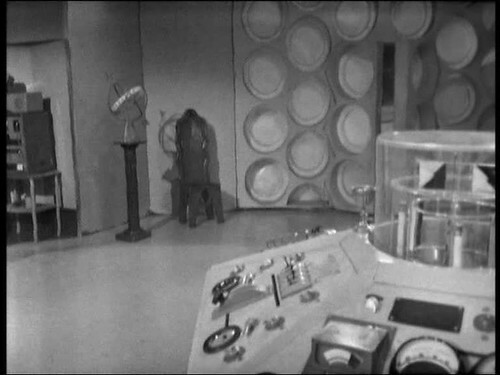 It not the only odd thing going on with the Tardis during this episode: at one point the Tardis console is seen to spin round rapidly. As we'll see in later stories, Ambassadors of Death and Inferno, the console can be removed from the ship though generally it's thought to be fixed in place. 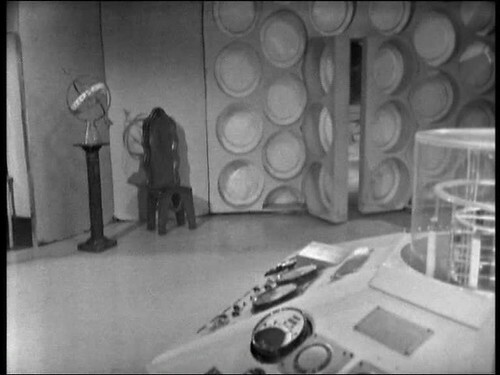 The end of this episode appears to be the first time the Tardis dematerialises without the Doctor! This first episode of the serial was watched by 13.5 million viewers, the highest number for any Doctor Who episode thus far and would remain so until the late 1970s when an ITV strike gifted the BBC several million Saturday night viewers.